All prices include batteries, charger and free shipping within the continental U.S. For more info, please call 1-800-449-8991. Q: Will the power wheelchair break down into sections so that we can transport it in the trunk of the car? A: Yes, some power wheelchairs do break down for transport, however, unless you are able to lift 60 to 70 lbs., we suggest purchasing an electric lift for you vehicle to transport the chair. Q: Do batteries and charger come with the wheelchair? A: Yes, batteries and charger are always included in our pricing, and shipping is FREE within the continental U.S.
Q: How far will the power chair go when it is completely charged? A: On a full charge, most power chairs will range between 15 and 20 miles on level surfaces. Q: How often should I charge the batteries? A: The batteries should be charged at least once a week for 8 hours, even if you don't use the unit. If you use the unit every day, you should charge the batteries every night, over night. Q: Do I plug the charger into a regular power outlet? A: Yes, just plug the charger into a regular 110 socket. The charger can be converted to 220 volt, if needed. Q: Will it harm the batteries if they are over-charged? A: No, the chargers on these units are designed to shut down to 1 amp when the batteries are fully charged, so that the batteries cannot be damaged. Q: Can the speed be adjusted on the power chair? A: Yes, most power chairs have a variable speed control that can be set between 0 and 5 m.p.h. This controller can also be programmed to lower top speeds for safety concerns. 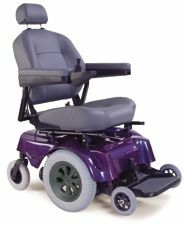 Q: Do I have to assemble the power chair when it arrives? A: No, we ship our units completely assembled all in one large box that is delivered to your door. Q: Can I take my scooter or power chair on the airlines when I travel? A: Yes, scooters and power wheelchairs have gell cell sealed batteries that are approved for airlines, boats and trains. Q: What is the difference between a front wheel drive scooter and a rear wheel drive scooter? A: Front wheel drive scooters are usually classed to carry 150 lbs. or less and are low to the ground. It is recommended to use front wheel drive scooters on level surfaces only ( sidewalks, indoors). Rear wheel drive scooters are designed with a higher ground clearance and more power and they will take you outdoors over grass and gravel. Rear wheel drive scooters are designed to carry 200 lbs. to 600 lbs., depending on the model you chose. Q: Will the scooter come apart for transport in my car? A: Some scooters do disassemble into 5 pieces for easy transport, with the heaviest piece weighing only 38 lbs. Q: How far will the scooter go when it is fully charged? A: Rear wheel drive scooters with 2 batteries will range approximately 15 to 20 miles on a full charge. Front wheel drive scooters with a single battery will range approximately 10 miles on level surfaces. Q: Can the speed be adjusted on the scooter? A: Yes, most scooters have a variable speed control that can be adjusted between 0 and 5 m.p.h. Q: Do I have to assemble the scooter when it arrives? A: Yes, scooters and power wheelchairs have gel cell sealed batteries that are approved for airlines, boats and trains. Scooter and Wheelchair Lifts F.A.Q. Q: Do I need an inside lift or an outside lift? A: Inside lifts are designed to be installed inside of a van, truck bed or car trunk. If you are installing the lift in a car trunk, you will need to be able to remove the seat on your scooter or power wheelchair. Outside lifts are designed to be attached to a class 3 hitch on the rear of almost any vehicle and they require no lifting at all. Q: How does the inside lift operate? A. The inside lift operates much like a crane, and pulls its power from your vehicle battery. A claw attaches to a docking device on your scooter or power chair. The lift then lifts the unit into the air, you then swing it over the trunk and the lift lowers it down. Q: How does the outside lift operate? A: The outside lift is a platform that lowers to the ground. You drive the scooter or wheelchair onto the lift, push a button to raise the lift and your off! The outside lift has automatic locking devices to secure the scooter or power chair to lift. Q: Will my Medicare or private insurance cover the cost of the lift? A: No. At this time, most insurance companies do not cover the cost of a lift, however, if you have a new Ford, GM or Chrysler vehicle, they may cover some or all of the cost of the lift. For more details, CLICK HERE. Q: How do I use my outside lift in bad weather? A: If you purchase an outside lifts, an optional scooter or wheelchair cover is available for a nominal fee. The motor on the lift itself is sealed to protect it from rain damage. Q: What do I do with my outside lift when its not in use? A: The platform on the outside lift automatically raises in the vertical position up against your vehicle when your scooter or wheelchair is not on it. The platform is perforated to remove wind resistance. Q: What kind of Warranty comes with the chair? Q: Is fabric protection available? A: All chairs come standard with Scotchgard fabric protection. Q: Will my chair work in the event of power failure? A: All chairs come equipped standard with battery back up should the power fail in your home. Q: Do you carry a Chair that reclines completely, like a bed? A: The pride DMR 670 model with bed option fully reclines to a complete Trendelenburg position, transforming your lift chair into a comfortable, adjustable bed.